This page contains specific resources developed for teachers using this Exploration. Who Were Pocahontas & Squanto? Evaluating the Disney Film "Pocahontas"
Use the Check Your Knowledge About Pocahontas worksheet (Microsoft Word format) to generate interest. The students are to mark true or false next to the statements. Hopefully there are some misunderstandings or misconceptions about Pocahontas that can be corrected by this unit. 1584 Attempted English Colony at Roanoke Island, N.C.
Exploration 1: Who Were Pocahontas and Squanto? 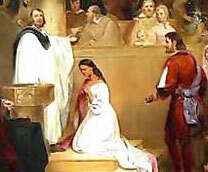 Look at the painting, The Baptism of Pocahontas, on the Who Were Pocahontas and Squanto? exploration page or click the picture to the left. Who do you think is centered in this painting? Are you surprised to know that it is Pocahontas? What else do you notice about the painting? What did Pocahontas look like? Find four contrasting images of Pocahontas and describe the differences in the way she has been depicted. Did the view of the Native Americans change as the Pocahontas images changed? Students can display these images in a presentation or in a word processing document and describe these differences underneath each image. In analyzing the images, pay attention to the dates of the images. What was happening in America with respect to Native Americans during that time?